If you have a hearty appetite and are looking for a great meal at affordable prices. Grumpy’s is the place to go for breakfast or lunch. 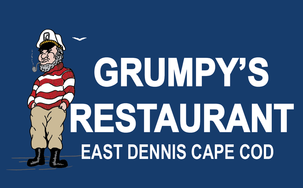 Located along 6A in East Dennis our Family-owned and operated restaurant has been serving home-style cooking since 1991, We serve breakfast & lunch year round to cape codders and its visitors. 7 days a week from 6 AM to 2 PM. Grumpy’s is well known for its delicious homemade soups, hearty meals, and warm atmosphere. And the friendly wait staff has been serving our loyal customers for many years. Grumpy’s is a family friendly restaurant, with a menu big enough to please everyone. At Grumpy’s we know that the best tasting meals are made from the finest ingredients. We prepare every meal with only the best ingredients. and each dish is cooked to order with the highest quality meats, cheese, and produce.